– The slaughter of brave dissidents in Syria. – Mobs storming American embassies and consulates. – Iran four years closer to gaining a nuclear weapon. – Israel, our best ally in the region, treated with indifference bordering on contempt by the Obama administration. “The blood-thirsty mobs in the streets of Cairo and Libya are further proof that the ‘Arab Spring’ is in fact an Arab winter. The Muslim Brotherhood is on the ascendency everywhere in the region and Barack Obama and Hillary Clinton are clueless. Even in the wake of the murderous attack, our government was condemning a movie as if a creative work can ever be a legitimate excuse for murder. What a shameful statement of appeasement on the anniversary of 9/11. “The vapid response of both President Obama and his Secretary of State refuses to acknowledge the source of the problem: the rise of the Muslim Brotherhood and Islamic extremism, made possible in part by Obama’s naive foreign policy. This great offense, the murder of U.S. ambassador to Libya J. Christopher Stevens and three other embassy staff, comes as Obama continues to send billions of dollars to the Egyptian and Libyan regimes. This can be nothing less than a catastrophic failure in foreign policy. The problem, the cause for the failure, is the ideals laid out underneath that policy. Ambassador Chris Stevens, and his three staff members, were fully believing in the leftist mantra that all we had to do was show respect and we’d win the day. I wonder, if in the moments before they expired, they realized the error of that line of non -thought. I rather tend to doubt it. Sadly fact never hinder the mantra of a leftist. In the meantime, we, in the form of Obama, apologize to to the protesters and the murderers of ambassador Stevens and his staff, instead of responding as we should have. Indeed, there’s not been this much sympathy for Lynch Mobs since Bull Connor. In effect, the Obama administration doubled down on its stupidity . They’ve yet to figure out that there are some things some ideas some ideals and some cultures that deserve no respect. That’s some situations require that no respect be shown. I would argue that radical Islam is one such. So far, folks, the entire narrative of the reason for the mob activity in the Middle East has been false. It’s a false narrative. A so-called fundamentalist pastor who never even saw this YouTube video that nobody else has seen, that’s supposedly produced by an Israeli Jew who turns out to be a Coptic Christian. A film that, in fact, may not actually exist. But if it does, nobody has seen the entire thing, as best we can tell. And we, nevertheless, are to believe that hundreds of thousands of Arabs in the Middle East are driven to march, riot, maim, and kill, based on this? Sorry, folks. I’m not buying this. I’m not joining this media bubble, this movie, whatever this is. If anything, it could even be a hoax. But it has nothing to do with this, other than being used to incite the rabble. But it is the reason this is happening. It just happens to occur on 9/11, by the way, and thereafter. I guess that’s just a coincidence! Meanwhile, 9/11 comes around, but our embassies and consulates are not fortified. Apparently there were no additional security measures. The Marines didn’t have bullets in Egypt. The president doesn’t bother with intel briefings since the 6th of September. That’s the last one he had. A British paper reports, citing senior American diplomats, that 48 hours prior to the attacks on our consulate and embassy, the government was aware of credible threats and didn’t do anything. 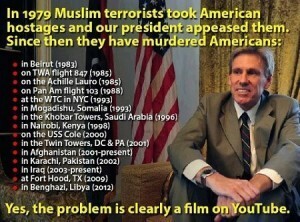 And whose choice was it not to reinforce the embassy at Benghazi? Hillary Clinton. Now, at least, we have an explanation for why the Clinton run State Department is refusing to answer any questions on the matter. Not only had the British told us repeatedly that attacks were coming, CNN reports that the Libyans did as well. I’d personally find it interesting that white house adviser Valerie Jarret has a full contingent of secret service personnel surrounding her, and yet for some reason this White House couldn’t figure out the people in the Middle East needed at least that amount of security. I wonder, however, if by virtue of this failure, we’re going to see less heavy Democrat campaign donors angling for ambassadorships around the world. Particularly, to the Middle East. I suppose there’s a never ending supply of true believers among leftists. And here’s Jay Carney out there saying, “Eh, it’s a movie. It’s not about American policy. That Benghazi attack? We don’t know that it was preplanned. It’s not a case of protest directed at the US.” If that’s right, how come they’re screaming, “Death to America! Death to America!” Why are they burning the American flag? I don’t see ’em burning videocassettes or DVDs. Why are they killing an American ambassador? Why are they attacking American interests? Well, it’s not a coordinated attack. It’s just the movie, just the movie. There were 400 people, and yet here’s the president’s spokesperson saying it wasn’t planned. So Carney’s contradicting the undersecretary of state. He’s contradicting the UK Independent and other sources quoted. “It wasn’t planned. It’s the movie.” Clearly this guy’s been told to go out there, “Jay, we don’t care how bad it tastes, you tell ’em it’s the movie. We don’t care what you have to swallow, Jay, it’s the film. That’s the answer to every question.” So he dutifully walks out there, and that’s his answer. This would be like blaming Abu Ghraib riots on Polaroid, or Kodak. It’s exactly what this is. I would point to the double standards being applied…. I observe that for example, the very same president who doesn’t seem to have a problem with insulting Christians calling us “Bitter clingers” and disregarding the first amendment rights of Catholics as regards abortion etc., tells us that we should not be insulting to Islam. Forgive me, but something doesn’t add up. And I wonder; if anti-Islam movies are responsible, does this mean that we’ll have to stop showing the pro-Obama propaganda film, that was created to help Obama’s re-election, “Zero Dark Thirty”? You may recall, the makers of that movie were given all sorts of access to classified material so as to make the movie more compelling and the re-election of Obama more possible. Of course, this is the same political philosophy that arranged for government support for “Piss Christ”, So perhaps the current excesses are not all the unbelievable, after all. 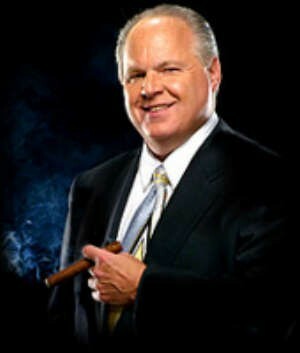 Now, of course, Rush is correct, this isn’t about the movie. The movie is an excuse. But if the left… this administration included, really thought that the movie was the issue, wouldn’t “Zero Dark Thirty” be axed? Jay Carney’s denials aside, the issue is the failure of Leftist policy. And what is Obama’s reaction to these horrific events, dead Ambassadorial staff, flags and embassies burning? More failure….He apologizes to the jihadis, as if WE did something wrong, and then goes off for a couple of fundraisers in Vegas and Colorado. Ponder the double standard here, as well… Can you possibly imagine the reaction of the press to, say, and George W. Bush doing that? I suspect that they would be running 24*7 “coverage” between now and the election. The failures are not just in foreign policy… The home front is strewn with Obama failures, as well, all seemingly based on the idea that if we just grew government enough and spent trillions of taxpayer money on industries and products that leftists like, or at least are not trying to eliminate outright with the force of government, that things would be all right. The continued and breathtaking unemployment figures are testament to the fact that liberal policy doesn’t work in that area either. We handed control of GM and Chrysler to the UAW, and in return got the Chevy Volt… which they just shut down production on last month…. It’s simply not selling. And GM loses $40,000 on every Volt they sell. Clearly, these policies are being generated by somebody who figures that the government is the answer to everything and has no clue about how private enterprise works. That description would seem to fit this administration quite well. There’s always the crony capitalism the scene the last three years, as evidenced by though not limited to Solyndra. There’s the war on energy, specifically oil and coal. That alone has done more than most of the damage to our economy. Then there’s health care. Unpopularly known as Obamacare, we have discussed this many times in these pages, and there seems little point on a long discussion on the point. It, too, can be considered is nothing less than a catastrophic failure. Obama is most certainly the food stamp president. He has created more dependency on government than any president in history, short of FDR. And yes, I’ll get to him in a minute. I would urge reading Doctor Thomas Sowell on the subject. Now, despite enlarging the dependency class to ever higher numbers, he still doesn’t have enough to get himself reelected. Yes, that means that I think that was a direct Evert at creating more dependency, so as to create a situation where reelection for the Liberal providing the government largess is easier. But clearly, he hasn’t spent enough tax money to buy himself votes. Trouble is, there is not one success , not one, that Obama can claim as his own during his administration. As has been discussed here many times, Mr. Obama had a specific job to do ; diminish America. He’s done it well. And who can argue otherwise? At all turns, he marched, no, lunged in precisely the wrong direction…. if advancing America’s interests in the world and its economic interests here at home, and individual freedom or it all on the plate. I suggest that there is no way you can obtain that kind of consistency without two things going for you; competency, and intent. In any event, that’s how we get where we are. And where from here? Well, now comes the task of re-election, despite these obvious and massive failures. They’re desperate to get past this speed bump known as the first Tuesday in November. How to do it? The answer is unfolding in front of us. Obama likes to paint himself as the new FDR…. not that the old one was all that great… FDR with his “Bold Experimentation” as Obama likes to say, extended what should have been a small downturn in the economy to a depression lasting over a decade… and the only reason we got out of the depression was WWII. Which makes some wonder aloud if history isn’t repeating itself. After all, FDR knew full well that the Japanese were planning attack on Pearl Harbor. And did nothing. 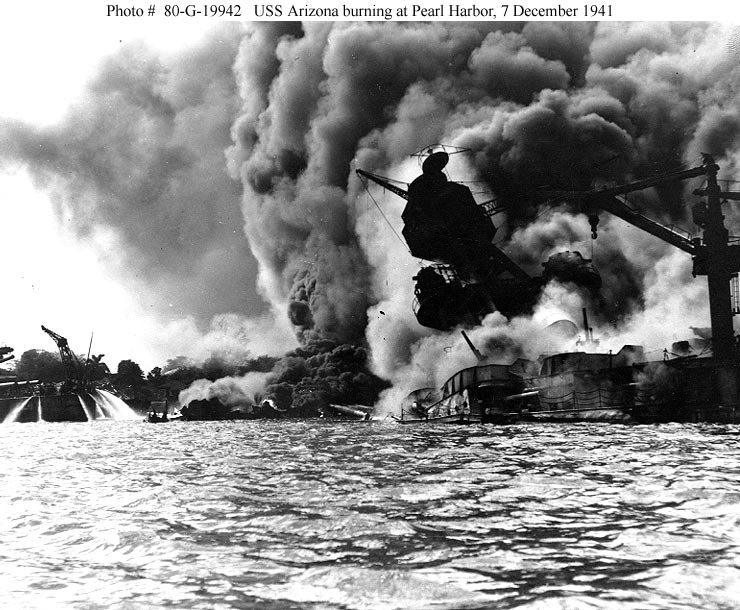 Most certainly, Pearl Harbor was the back door into the European war for FDR. Clearly, a way out of the current economic crisis of the time, and somewhat less clearly a guaranteed reelection. There are those who will suggest that Obama and company are too incompetent to pull off this kind of deception. I disagree. In political terms Obama and his people have been more than competent to the task that they were set …. installing the Liberal mantra as law, regardless of the consequences. I certainly wouldn’t put an FDR -like deception in this matter, past them. Assuming what I’m suggesting is correct, we’re going to see some military action in a big way between now and the first Tuesday in November. Which, given the de-funded state of the Military… another part of the leftist mantra… will be at least somewhat muted. At the very least, assuming that Obama does not get reelected, Romney has a serious clean-up task in front of him I’d not wish on anyone.